Heidelberg, Germany – The 15th International SPECTRALIS Symposium (ISS) took place in Boston, USA, Oct. 13-14, 2017 bringing together SPECTRALIS® enthusiasts from all over the world. 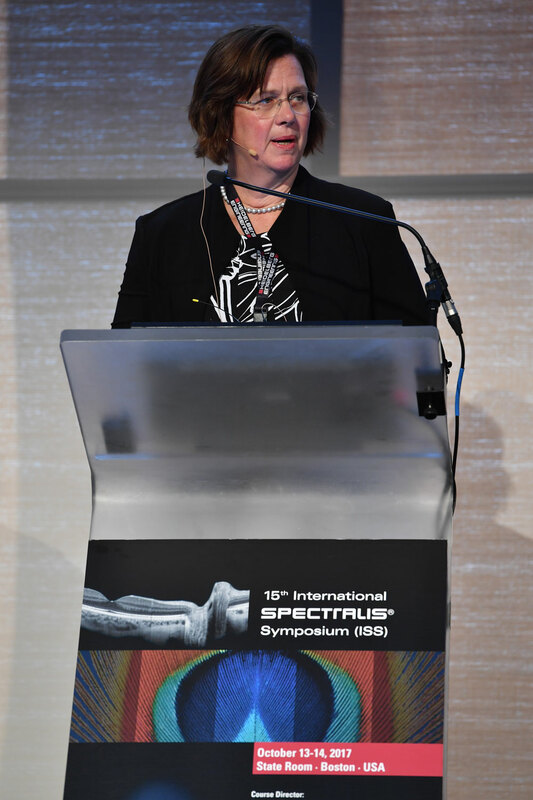 Joan W. Miller, MD, Chief of Ophthalmology, Massachusetts Eye and Ear and General Hospital Boston, acted as course director and a faculty of leading experts discussed the latest developments in ophthalmic diagnostic imaging. Dr. David Brown spoke during the opening session about the effects of microgravity in long-term space flight on the human eye. This subject is a classic at this meeting due to the fact there is a SPECTRALIS on the International Space Station and NASA has relied on this technology for years to monitor the eye-health of astronauts on the ground. How the repeatability of the SPECTRALIS platform can create greater clinical efficiencies (Ethan Priel, photographer). There were presentations about investigational imaging techniques such as: Fluorescence Lifetime Imaging Ophthalmoscopy (FLIO), erythrocyte-mediated angiography or anterior segment outflow imaging. As demonstrated by Dr. Lydia Sauer, of Dr. Paul Bernstein’s research group in Salt Lake City, FLIO might be of particular interest for the diagnosis of Macular Telangiectasia. Dr. SriniVas R. Sadda on his part reported about a study exploring FLIO in the diagnosis of Alzheimer’s disease. ISS 2017 proved to be a highly interactive meeting with a “scientific marketplace” attendees could visit during breaks as well as frequent Q&A opportunities during the sessions. The event venue, the State Room, located on the 33rd floor of a high-rise building in downtown Boston, was a highlight by itself. During the breaks ISS attendees could enjoy magnificent views of Boston and its harbor. At the end of the ISS 2017, it was announced that the 16th International SPECTRALIS Symposium will take place Oct 12-13, 2018 in Bonn, Germany, at the former Plenary Chamber of the German Parliament now known as World Conference Center Bonn. Dr. Joan W. Miller, Chief of Ophthalmology, Massachusetts Eye and Ear and General Hospital Boston acted as course director. *The SPECRALIS OCT Angiography Module is available only in certain countries. Check with your contact person for details.